This year’s late August bank holiday weekend coincided with ‘springiest’ spring tides of the year, providing the Farnes trip Marshalls with a logistical nightmare in planning boat launching and diving amongst the ‘exciting’ currents predicted between the islands. Nonetheless, 8 divers plus Family Williams set off enthusiastically for the Farnes, with decent weather forecast and a recently repaired, (but as yet untested) Osprey in tow. Dave and Fran also brought along ‘Skinny Dip’, their small RIB, as an insurance policy in case of a recurrence of the Osprey’s recent illness. We awoke on Saturday morning to a still, but murky day, and headed to Seahouses harbour to get the boat launched before the harbour dried out in the lowest tide of the year. The morning dive was on the St Andre, a 70m long, 1100 tonne wrought Iron carrier which sank in 1908 after hitting the Crumstone. It’s very flat wreck, with two intact boilers and lots of life, including lots of wrasse, and some huge crabs and lobsters. 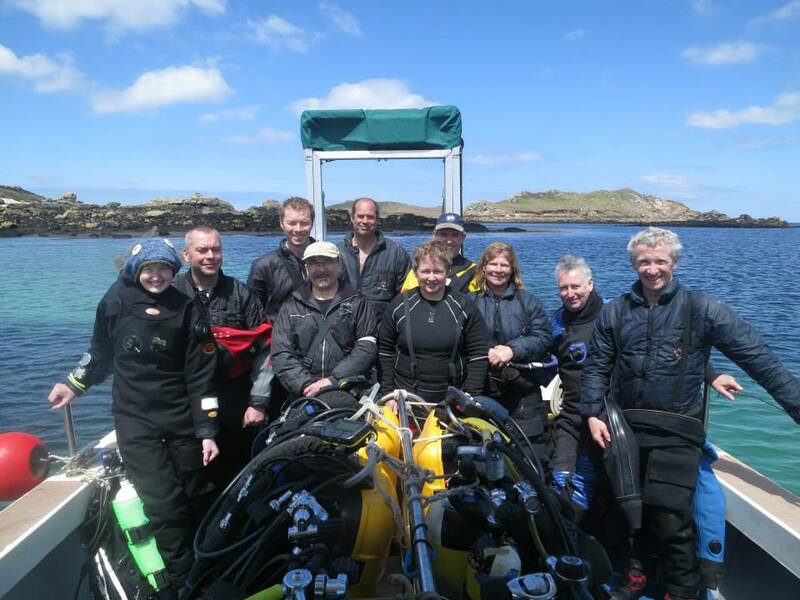 Everyone had an enjoyable dive, however the surface time wasn’t so pleasant, with a confused sea resulting in some green faces around the boat, and at least one diver separated from that morning’s breakfast! Due to the big tides, we stayed out all day, so headed for some sheltered water for lunch, followed by an enjoyable drift dive in the afternoon. Saturday evening brought along some heavy rain (the forecast lied! ), meaning the planned BBQ was postponed in favour of a trip to the chippy. day. When we suggested we might still head out, his considered advice was ‘Have you thought about a trip to Bamburgh Castle?! !’ Thinking all these locals must be wimps, we loaded the boat and set off undeterred. An hour or so (and several boats full of water) later, we arrived back in the harbour, tails between legs, and jumped in the car for a very nice afternoon at…… Bamburgh Castle!! Monday brought an entirely different day, with clear sunny skies, and a much calmer sea. In the morning we dived Piper’s Gut, a constriction between two Islands which funnels the ebbing tide with strong currents, making for a great drift dive. This is the area where Grace Darling famously helped rescue the crew of the paddle steamer Forfarshire on a stormy night in 1878. The big tides turned this normally exhilarating drift into something akin to a rollercoaster through an amazing landscape of plumed anemones and dead man’s fingers. Some people loved it so much they went back and did it 3 times! The afternoon dive was equally exciting, dropping in near a small colony of grey seals round a small rocky outcrop. The seals didn’t disappoint, their inquisitive nature getting the better of them, and pretty soon we were surrounded with the curious young seals coming and tugging at fins and goody bags. 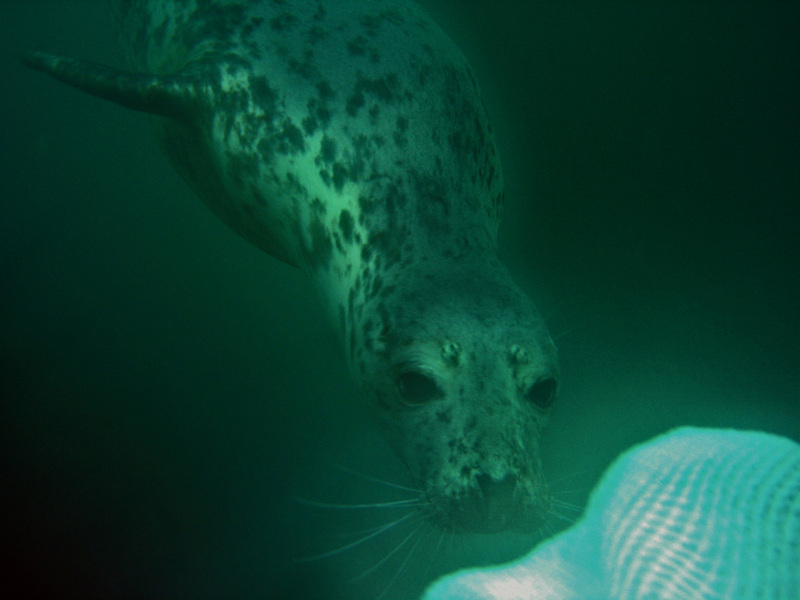 This was a fantastic dive to end on, and a genuine privilege to interact with these amazing creatures. Many thanks to Fran and Dave for organising a great weekend. 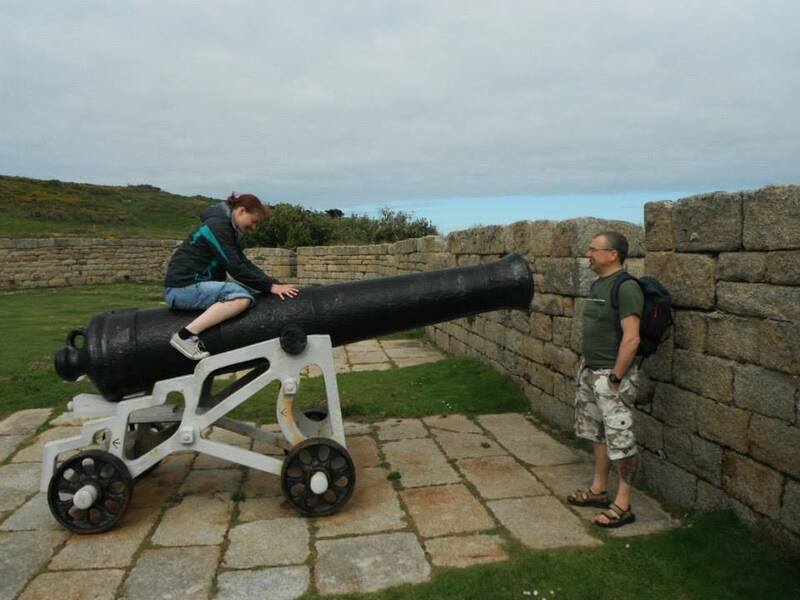 The late May bank holiday trip was to the Scilly Isles. Almost as far South as last year’s trip to Scapa was North. The team (comprising 16 people and two dogs had agreed a 4am start to manage bank holiday traffic jams, caravans etc. It seemed like a good plan especially when I checked the BBC travel news at 3am – only one reported jam; very severe delays, M5 southbound near Bristol. The motorway was closed due to a multi-vehicle accident and diversions were in place. Nevertheless we set off in good spirits and, thanks to excellent navigation and ‘local’ assistance (thanks Fran! ), we made it past by taking a slightly longer diversion. And so to the diving; the week took in a wide variety of wrecks and reefs, spoilt only by the poor viz and being blown out on the Wednesday. It is only a small chain of islands but the Scillies have proved to be a magnet for wrecks. Shallow shoals and reefs are strewn with vessels going back many decades. 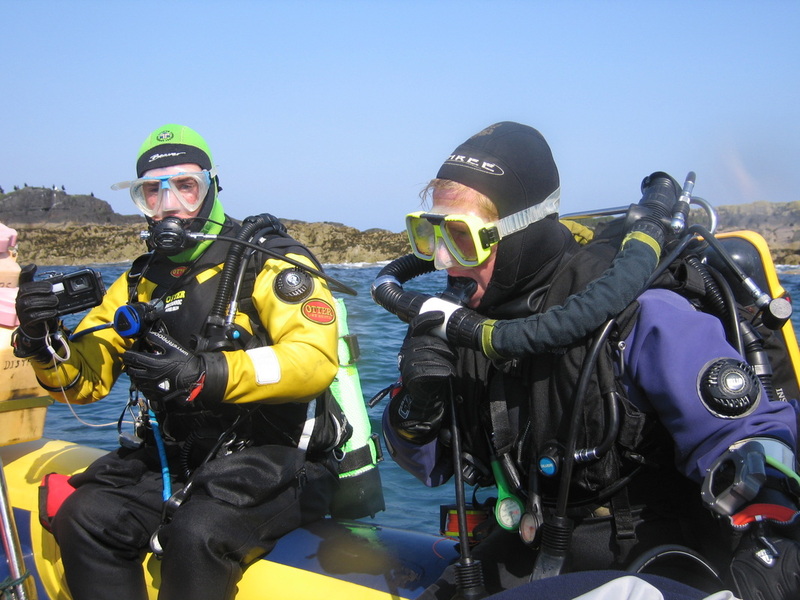 In many cases you can do your safety stops on the reefs that sank the ships – a far cry from the mid-water stops of Scapa! Our skipper, Dave McBride, finally got his lift working on the last day but showed himself to be a very knowledgeable skipper who also provided extremely useful photographic consultant. lifeboat, Thursday was fish and chips on Porthcressa beach front followed by a screen show from our skipper, finishing on Friday with the traditional end-of-trip meal. One of the highlights of the trip had to be the fortitude and persistence of our cabin boy, Martyn. His helpfulness on the boat was only matched by his lack of skill at the pool table, although, to be fair, a week’s practice did pay dividends at the end of the trip. Steve was beginning to regret ordering the seal burger for lunch! Ten of us, plus Eagle, went to Pembrokeshire for the May Day Bank Holiday weekend. 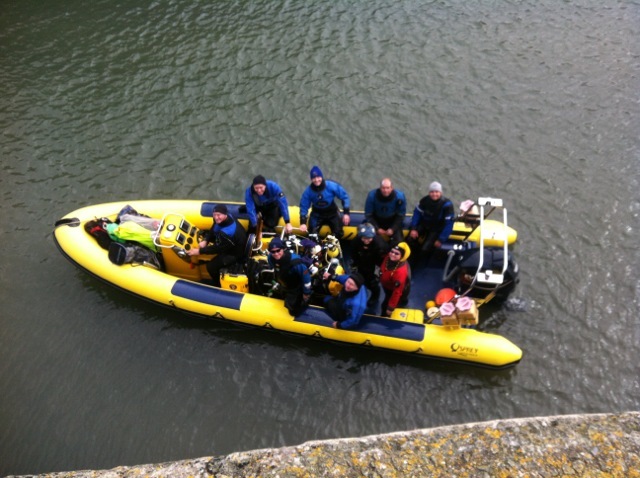 This was the first UK sea dive trip this year (at the third attempt). Claire’s master plan had us launching at Dale and diving in St Bride’s Bay, but the winds were stronger than forecast. Having poked our bows out into the open sea on Saturday morning and seen the large swell, we returned to the shelter of Milford Haven and dived the “Dakotian” in 16m of pretty murky water. In afternoon the weather was no better, so we tried the neighbouring wreck the “Behar” (also 16m). A new wreck for RRSAC – perhaps next trip we’ll be able to see more than a metre of it at a time! 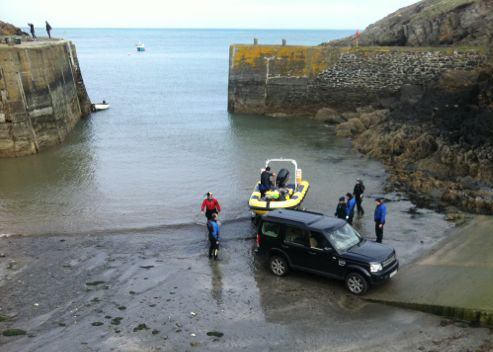 The SW winds continued, so for the Sunday and Monday we launched out of Porthgain on the North coast. This gave us calmer seas, a nice little harbour village, and some sunshine. But the wrecks were elusive. We dived the vicinity of the “Vendorm” down to 30m or so, and the “Nimrod 2” (21m) also seemed to have gone missing. 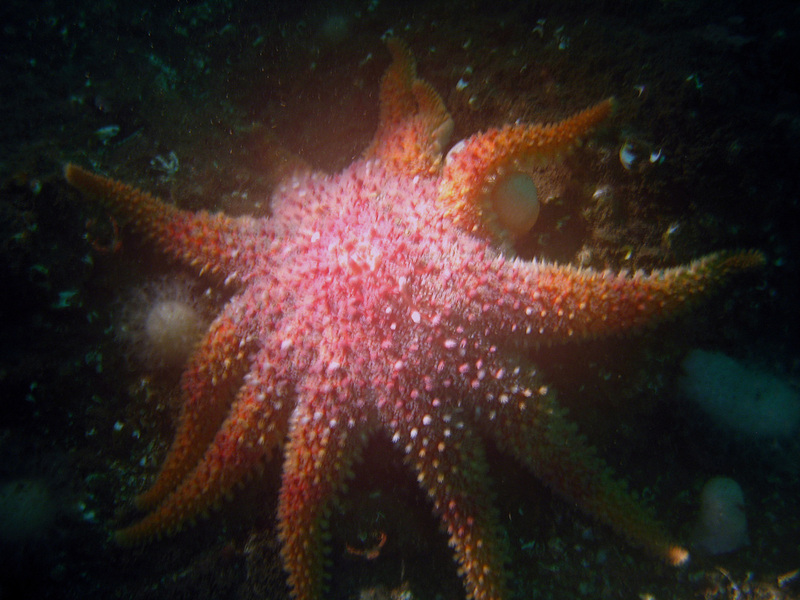 The vis still wasn’t great but there was a bit of marine life to look at. So when we couldn’t spot the “Amazonense” (15m) on the echo sounder on Monday, things weren’t looking good. But she was there – just very flat! – and the vis had improved so that most of us finished with a nice dive. Lastly a special mention for Claire’s choice of accommodation – a basic bunkhouse but with great breakfasts and evening meals. 'Almost' enough water to launch the Osprey!